First of all, it’s not too late to enter my GIVEAWAY. Help some people who really need it. Save lives (for serious). And if those incentives don’t do it for you – take a chance to win some pillow cookies (got you there, didn't I?)! 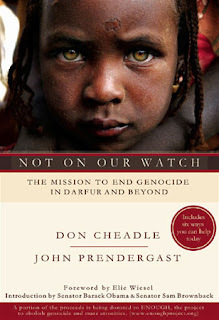 And to continue with my recent humanitarian theme, this week I read Not on Our Watch by John Prendergast and Don Cheadle. I don't usually blog about this type of non-fiction, but it’s very good! 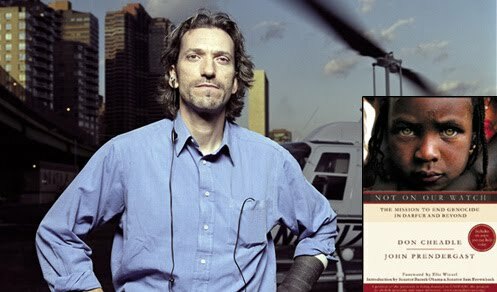 The actor (Cheadle) and activist (Prendergast) co-wrote this book, which focuses mainly on the genocide in Darfur, but also on other crisis areas including the Congo, Somalia, and Uganda. It is very accessible – knowledge of the area and conflicts is not a pre-requisite – if you’re at all interested in knowing what the whole Save Darfur/ENOUGH Project thing is about, then this is a great place to start. There’s enough narrative mixed in with the history and policy recommendations to keep it interesting and light. Let’s just say that on a scale of 1 to fun, Not On Our Watch ranks about midway between The Fountainhead (un-fun) and Going Solo (maximum fun). Prendergast and Cheadle tell their own stories. 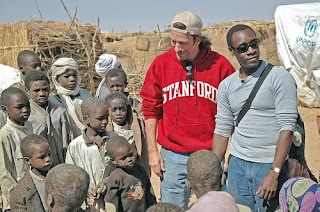 Cheadle’s interest in Darfur began with his involvement in Hotel Rwanda (I love that movie! ), while Prendergast writes about his early activist activities and experiences in Africa. Their personal narratives and memoirs are integrated with practical recommendations. They offer six strategies readers themselves can implement: Raise Awareness, Raise Funds, Write a Letter, Call for Divestment, Start an Organization, and Lobby the Government. Though it’s a book about a horrifying genocide and crimes against humanity, Not on Our Watch is uplifting and inspiring. It was published in 2007, but the lessons are still relevant. AND Prendergast’s and Cheadle's new book The Enough Moment is about to come out - you can pre-order it here. To read an excerpt from the book, go here. Listen to an NPR interview here.